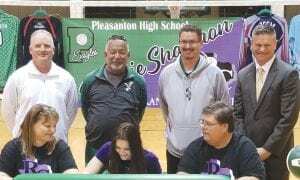 Pleasanton’s Kaycie Shannon signed with Ranger College to play volleyball on March 19. Ranger College, an NJCAA Division I program, went 23-12 in 2018. “It wasn’t as much numbers, but the coaching style that suited me and the girls on the team. I talked to them on the daily. It was more about how I felt than how it stood out,” she said. Shannon said she hopes to play for a four-year college after her two years at Ranger College. She mentioned that many from the school are recruited by larger programs. Shannon helped the Eagles win 64 games in the past two years and make back-to-back regional quarterfinals. Last year, she played in the Texas Girls Coaches Association All-Star volleyball game. By playing club volleyball with several of her Pleasanton teammates, Shannon has been able to thrive in different environments and see many different styles of play. Shannon played outside hitter as a senior for the Eagles after being a middle blocker, as Aguirre needed to use her as a lead hitter. At Ranger College, she will be featured in a variety of roles.